During the 1930's in England, a new affluence was to be seen, enjoyed by the middle and upper classes. Furniture requirements became associated with status and a demand for top-quality leather, very expensive compared to other soft furnishings, became the benchmark for seating in the luxurious residence of the expanding nouveau riche. 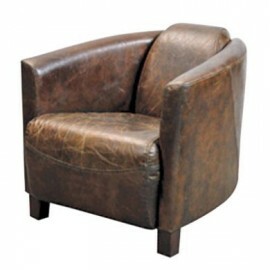 Our Vintage leather chairs and settees are expertly crafted to replicate the antique look with incredibly realistic distressing in the areas that would have received most natural wear over the years. Manufactured with a top quality hardwood frame, eight-way hand tied springs and a cleaver combination of foam; fibre and duck down fillings give that desirable lived-in look. The leather needs periodically feeding with a propriety brand of "leather care" wax or cream to retain the soft, luxurious condition. Classic leather furniture, you've always dreamt of.